The seal was located in the vicinity of Tobacco Bay Beach in St George’s almost two weeks ago, and since that time, has been under the care of the dedicated staff of the Bermuda Aquarium Museum and Zoo [BAMZ]. 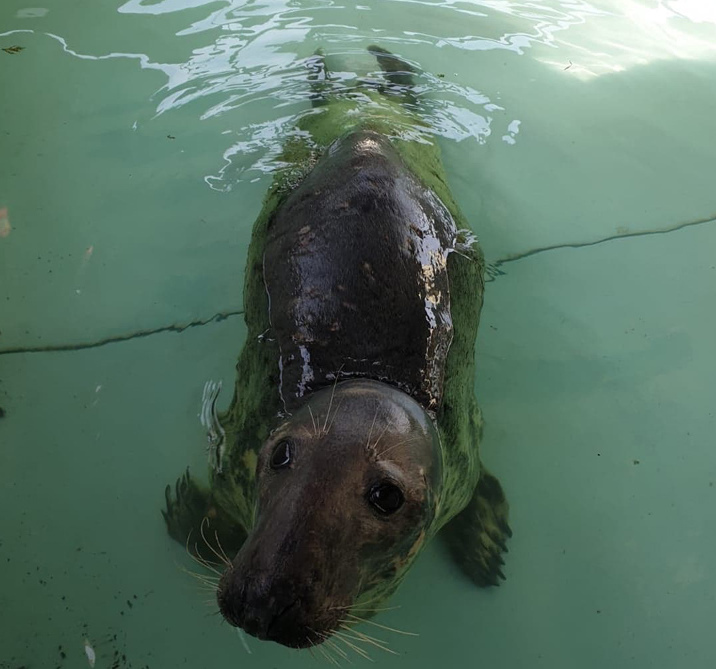 A spokesperson said, “The female grey seal is currently being cared for by the BAMZ wildlife rehab team and observed by lead BAMZ veterinarian and Principal Curator, Dr. Ian Walker. “Thus far we can report that she currently has an elevated white blood cell count, which means she has an active infection. She is still in critical condition, but we remain cautiously optimistic. “When she arrived, the count was at 27,000 and it has now dropped to 22,000. The decreasing count is a sign that her body is trying to heal, but as the average white cell count in a healthy grey seal is approximately 8,000, she has a ways to go. I cannot make up my mind between LUCKY and TOBACCO. Her name should be Lucille (loose seal) ! lol. Reminds me of a rather colourful local family who a long time back had a rather eccentric great great aunt named Lucille. They referred to her as Aunt Loosewheel !